International Finance Centre of Hong Kong, where the Dark Knight made a stunning descent, defying villains in the new Batman movie. Hands down the best Cityscape shot I've seen on this site. Yeah this is totally amazing! The best night cityscape without a doubt. I imagine this is probably an HDR or some type of blend of exposures and I love how you managed to keep this very realistic with perfect exposure control. Keep it up. Probably one of the best night wallpapers out there. What camera/lens/exposure did you use to take this? This is amazing! I have never seen such a high quality example of a city scape. I love the fact that there is little or almost no visible blur on the water from the long exposure. Keep up the amazing work! With that much talent, you could make a lot of good money! Truly amazing!!!!! Great great night shot!! It don't need many words. Great!! 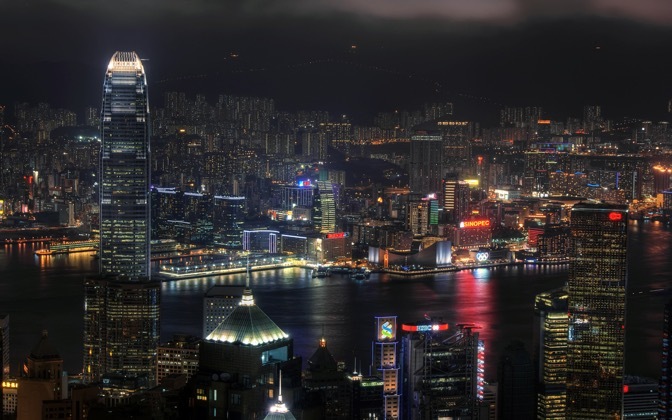 one of the best night city scape pictures i ever layed eyes on. one of my favorite pictures of all time. much thanx, ima enjoy this picture forever. This is now my wallpaper, supplanting my previous one of nearly 2 years. Best shot in dark ever seen!Top tech. all over!One of the best locations as well!Thank you for sharing! This is an extremely efficient image. I like all the lights in this image, it brings more excitement and energy into the picture.